Preparations for the largest editions of the International Defence Exhibition (IDEX) 2019, the Naval Defence Exhibition (NAVDEX) 2019 and the International Defence Conference are underway, as the Higher Organising Committee met to review arrangements in the run-up to these much-awaited events in the Emirate of Abu Dhabi. Organised by Abu Dhabi National Exhibitions Company (ADNEC) in collaboration with the UAE Armed Forces, the coming editions of IDEX and NAVDEX will be held under the patronage of His Highness (H.H.) Sheikh Khalifa bin Zayed Al Nahyan, President of the UAE and Supreme Commander of the UAE Armed Forces, from 17th to 21st February 2019 at the Abu Dhabi National Exhibition Centre. 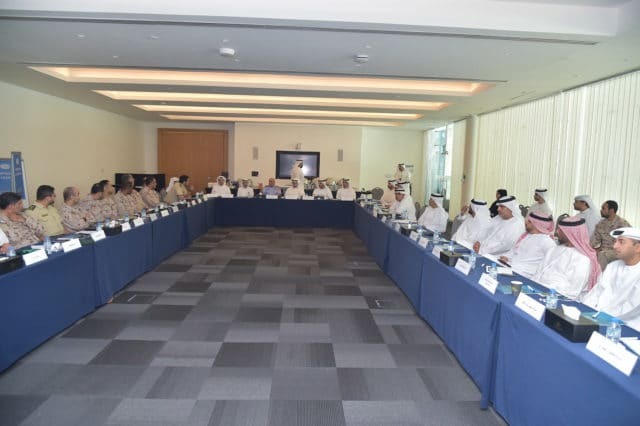 The coordination meeting was chaired by His Excellency (H.E) Staff Major General Pilot Faris Khalaf Khalfan Al Mazrouei; Chairman of the Higher organizing committee of IDEX and NAVDEX 2019, in the presence of Major General Staff Pilot Ishaq Saleh Al Balushi, Deputy Chairman of the Higher Organising Committee of IDEX and NAVDEX 2019 and Humaid Matar Al Dhaheri, Group CEO of ADNEC, as well as heads and members of sub-committees from public and private sector entities. For his part, Humaid Matar Al Dhaheri, Group CEO of ADNEC, emphasized on the pivotal role of IDEX and NAVDEX in gathering the most prominent leaders, experts and decision makers in the defence sector and offering the opportunity to take advantage of the latest developments and transformations in this industry, which is currently witnessing continuous growth. “Over the years, ADNEC has been able to position itself as a global leader in organizing, some of the world’s leading events, congresses and exhibitions through organising one of the largest defence exhibitions globally. The upcoming edition is expected to be the largest among the previous ones. Celebrating the Silver Jubilee edition of IDEX next year demonstrates our success in hosting leading events backed up with our advanced infrastructure, as well as the water, outdoor exhibitions space, as well as the water, shows dedicated spaces” Al Dhaheri added. The two parallel mega events, which will welcome senior military officials and experts from the region and the rest of the world, are expected to witness the signing of several major agreements and deals between companies involved in the defence and military sectors. The events will also see the signing of strategic partnerships between different regional and global entities. The previous edition of the exhibitions saw a huge turnout, where more than 1,235 exhibitors from 57 countries participated and agreements worth over AED 19.1 billion were signed, making it the most successful season of the event since its launch in 1993, with more than105,000 visitors from around the world along with more than 1,000 local and international media representatives covering it. The Abu Dhabi National Exhibition Centre is all set to welcome organisers, visitors and prominent delegates to the much-awaited events, with upgraded and revamped facilities, cutting-edge technology and fully customizable 133,000 square meters of indoor and outdoor space to be utilized in hosting the upcoming edition of the IDEX which is expected to be the largest since its inception in year 1993.